We started off July with a bang and kept going all month long! 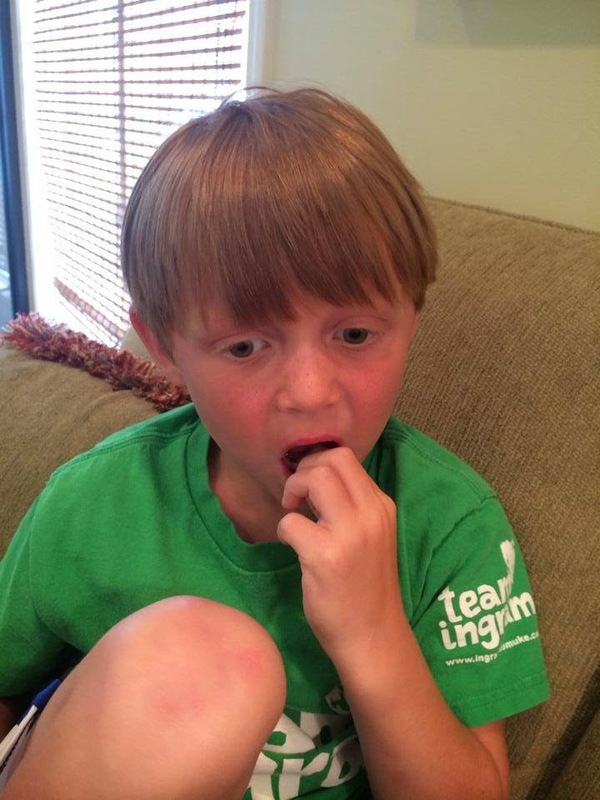 Ingram's buddy Nolan came over with his family to swim and cookout one night and it was a super fun night for all of us. Ingram, Nolan, and Aiden had a blast swimming and at one point Ingram said "No Girls Allowed!" since Madison was at camp and Lindsey was at soccer. It was definitely a boys night with cannon balls, Pokemon and Digimon card games, Wii games, and running around all night without shirts! 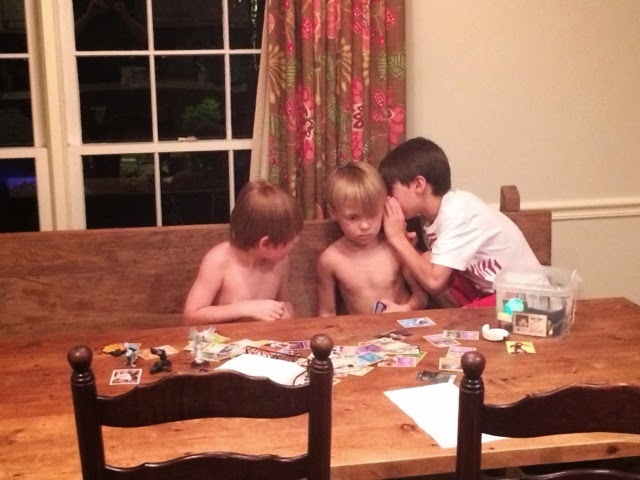 There's Nothing Like Playing Pokemon And Digimon Cards With Three Boys Who All Want To Win! "It Was Like The Best Night Ever, Daddy!" 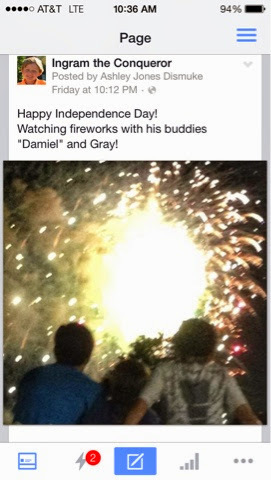 Next up G-Mommy, G-Daddy, and Grandmother drove in from Texas to spend the 4th of July with us! Lindsey and Ingram got a little special attention and had lots of fun doing projects with them at the house and taking them to the Fireworks. 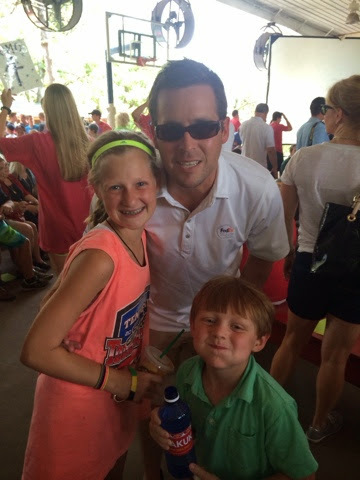 Personally, I think going on the boat was their favorite thing because they got to see G-Daddy and G-Mommy on skis and Ingram and Lindsey showed them all sorts of Kneeboarding stunts! 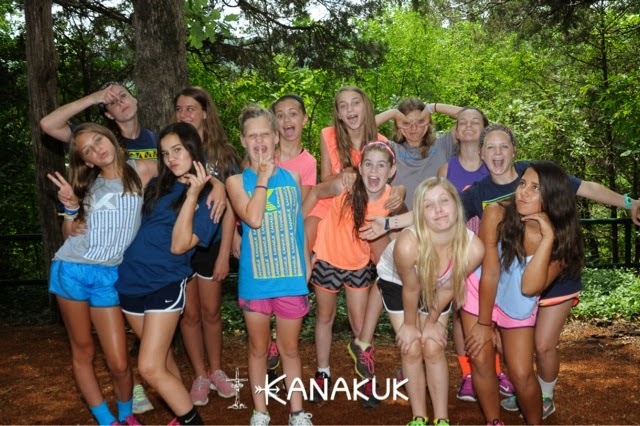 Madison missed it but she was having her own set of fun at Kanakuk! 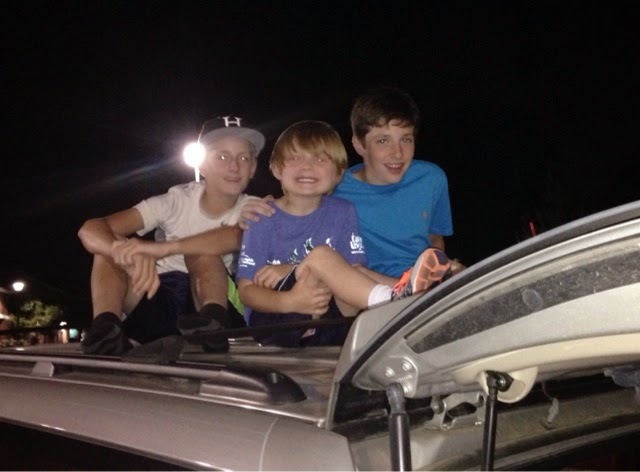 Especially When They Get To Sit On Top Of Mrs. Shanda's Suburban!!! Can't Leave Out Our Girls!! They Were The Entertainment Before The Fireworks Started!! Puzzles Ang Painting With Grandmother, G-Mommy, and G-Daddy! "Yeah Baby! I Love Kneeboarding!!!" 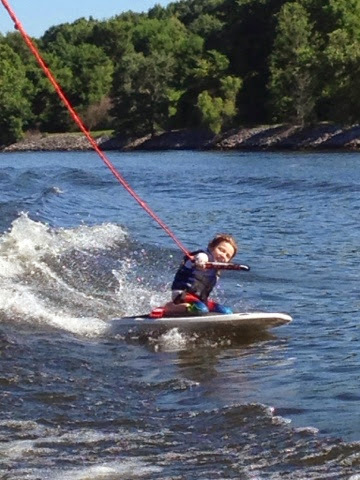 G-Mommy And G-Daddy Know How To Ski! Heads Up!!! Ingram's Driving Down The Tom Biggbee! Wishing Madison Was With Us Too!! ...With Her Crazy Cabin Crew!! 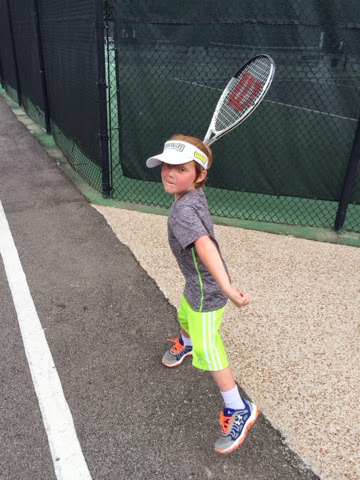 Ingram also got to do another camp and has claimed (at least for this week) that tennis is his favorite sport! 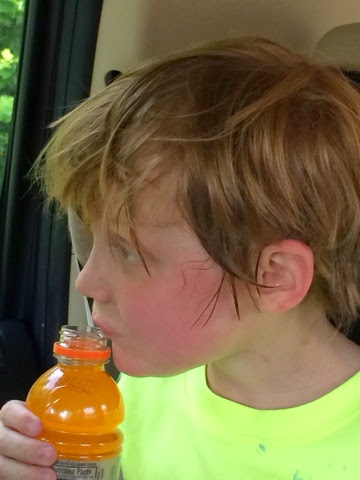 He had so much fun even despite how hot it was. I think one day his face was as red as a tomato and his hair looked soaking wet from the sweat. Wimbleton, here comes Ingram! His Baseball Jersey To Soccer Camp. We Just Can't Keep All Of Our Sports Right! 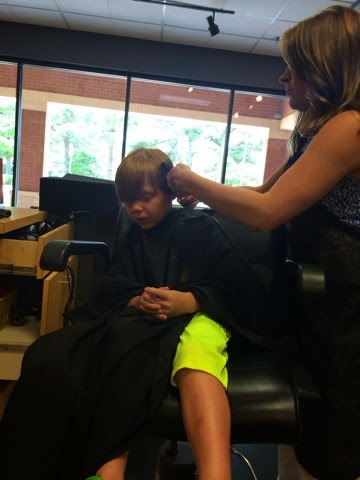 Poor Ingram...It's Way Too Hot For All That Hair! So Against Better Judgment, Ingram Got A "Short" Haircut! 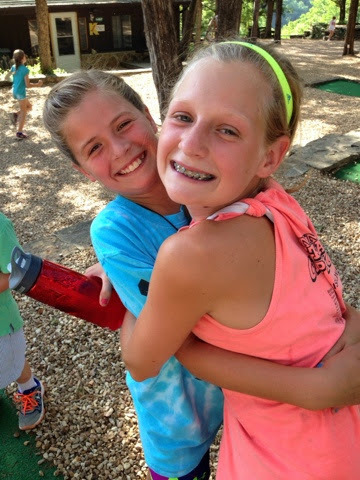 Finally it was time to pick Madison up from Kanakuk and we were so excited!!! The road trip up was great but for the last two hours, I think we all were very close to getting carsick because we went on backroads because of construction up and down and around the mountains. Even Craig was turning green and that never happens! Madison was so glad to see us and the kids were just as excited to see each other as we were to see them. 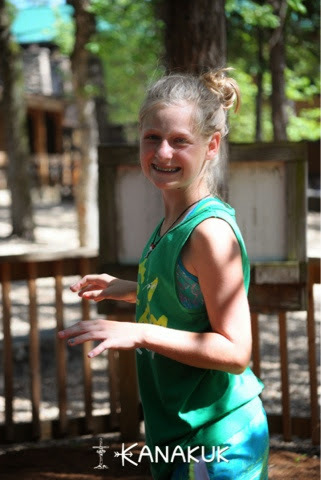 We had fun over the next few hours with her and all her Kanakuk friends, but had an long trip home on Saturday. Madison was so glad to sleep in her bed after three weeks of being gone; she was even excited to see Beau which rarely happens! Someone Was Soooo Happy To See Us! Anything Could Get In Between That Hug!! She Couldn't Get Enough Of Ingram During K-Life! When I Go To Kanakuk Next Summer! "WHAT???? Mommy Is SOOOOOO Not Ready For That! 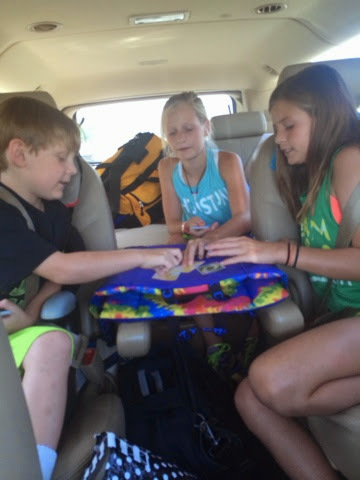 Playing Cards On The Long Trip Home! The Only Thing Missing Here Is Beau!! We had a surprise package from a friend with Relay for Life that lives in Abu Dabi that was definitely one of a kind! 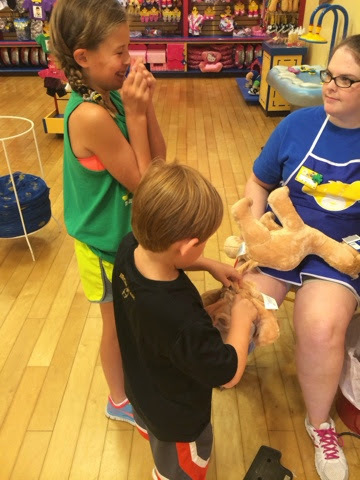 She sent us Camel's from her Build-A-Bear in the Middle East and the kids got to go to our Build-A-Bear and fill up with loving! Ingram and Lindsey couldn't wait till Madison was back so they went ahead and filled theirs without her. It was so fun telling our story to the Build-A-Bear people about how we got a hold of the camels and they were so excited too because they had never seen the camels either. Build-A-Bear Never Gets Old For These Two! It's A Good Thing Build-A-Bear Is a St. Jude Supporter! 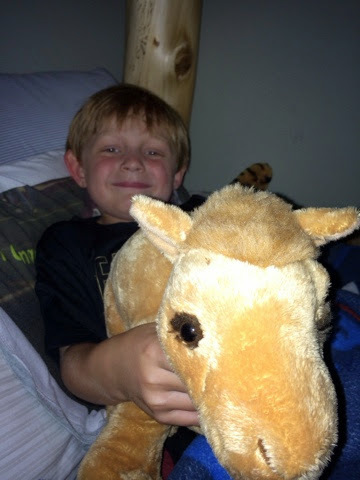 One Happy Little Dude With A Soft And Squishy Camel! Once we were back home and somewhat settled, we had more fun! 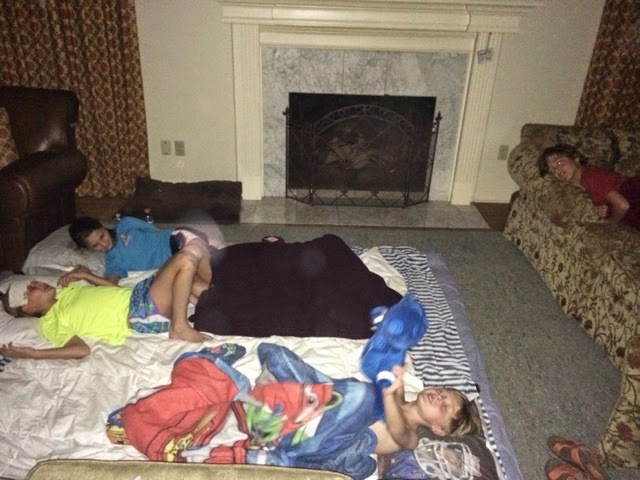 One of our St. Jude family friends came over and we all had a super fun time cooking out and playing games...IN THE DARK!!! 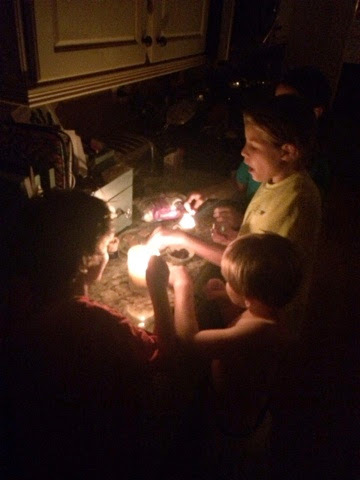 Not exactly by choice, but we made the best of it when a huge storm came through and knocked out power for about 16 hours. 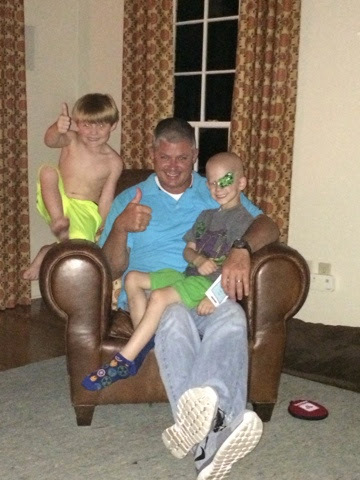 We also had Mimi, Pops, Brett over to spend the night and Lindsey brought a friend home from soccer practice to spend the night too! I do think it was one of the most fun dinner parties we've had...S'mores by candlelight, lots of noise by all the kids, and of course Beau was trying to get a little friendly with many new legs that night! 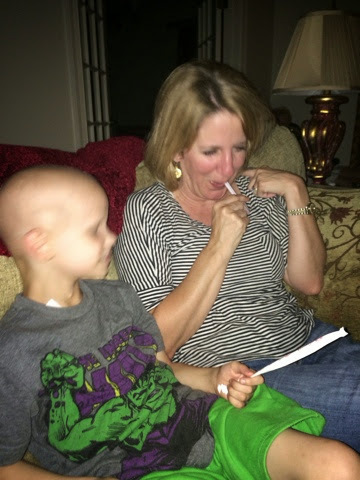 The prize however goes to Reid's mom Amy for passing along an "straw/arm tooting" trick to Ingram that our favorite nurse Pam had taught Reid. Ingram, Reid, And Reid's Dad Lance All Smiles! Thumbs Up For A Camera Flash! And Here's His Mom Amy! Queen Of The Straw/Arm Poots Thanks To Pam At SJ! Lindsey, Maia, And Ingram! Poor Mimi And Pops...They Were In There Too! Mr. Aaron and Mrs. Erin moved back from China this month and Mr. Aaron stayed with us while he was in town and the kids were soooo excited to see him! We had dinner (but it wasn't Mr. Aaron's favorite taco dinner and Daddy reminded me of that) and swam and played Wii with Mr. Aaron until the kids had to go to bed. 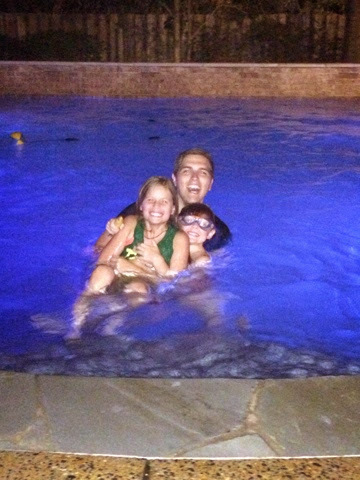 Mr. Aaron Enjoying The Water Again With The Kids! 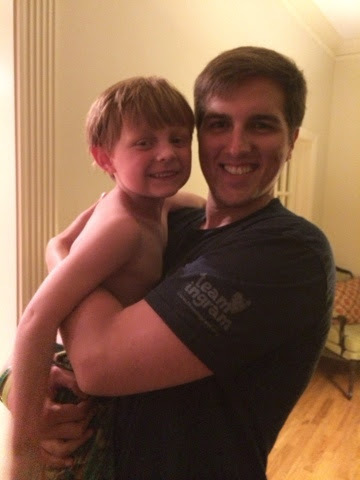 Ingram Is So Excited To Have Mr. Aaron Back In The States! We surprised Daddy with a "Happy Heart" cookie cake to celebrate his 7 years post Open Heart surgery! I'm pretty sure he wasn't expecting it, but the kids were soooo excited to pull one over on him. Ingram wasn't even born when Daddy had surgery so Lindsey was telling him all about it. I think we're the luckiest family in the world to have God as our Healer for both of our guys! 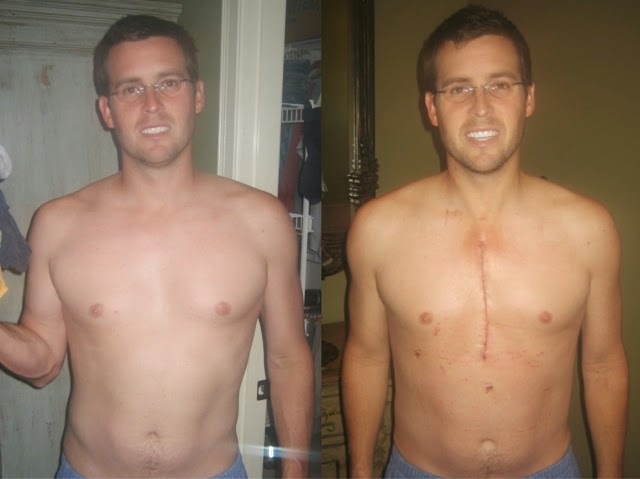 This Is Daddy The Night Before Open Heart Surgery On The Left. And Again Four Days Post Surgery Once We Were Back Home On The Right! 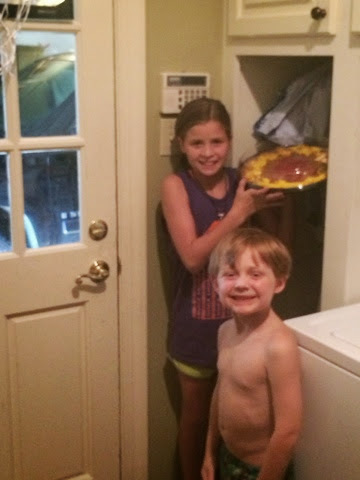 These Two Picked Out The Cookie Cake Since It's Daddy's Favorite! Funny Thing Is These Two Devoured The First Two Slices! 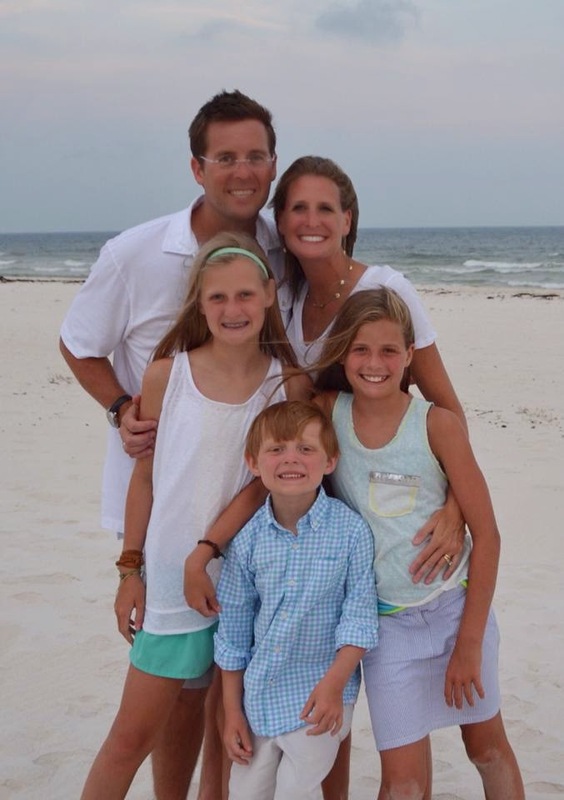 We spent the end of the month at the beach with the family...and I'm not just talking about the 5 of us; we went with Mimi and Pops, Amye and Len, Carley, and Brett, and all of us! We had a great week in Perdido Key and the kids all had the best time at the beach, at the pool, and everywhere in between! There were definitely some hi lights of the week that include the Fire Department (TWICE!! ), two anniversary dinners, banana boats and para-sailing, piles and piles of sand, dancing with lots of college girls (don't worry, it was Ingram and Brett!! 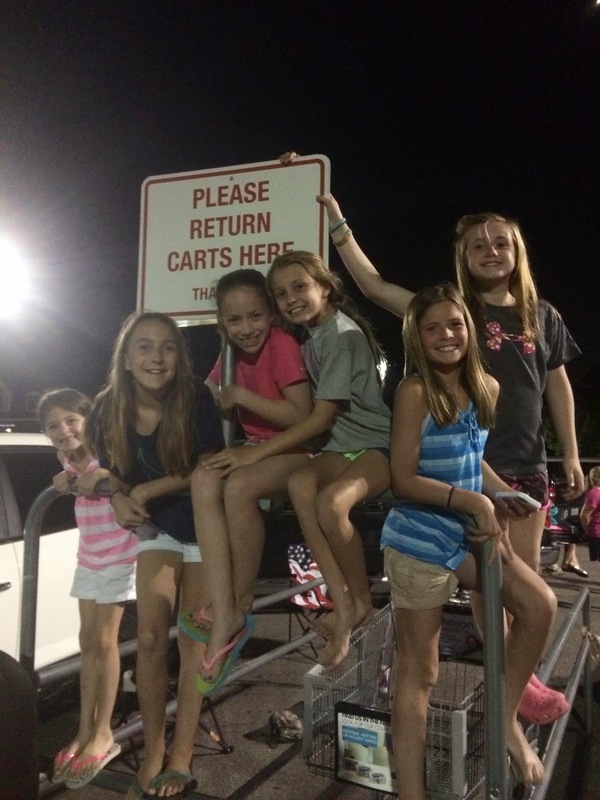 ), a foam machine, racing go carts, bumper boats, and the Skycoaster! Even Though We're On Vacation, There's No Vacation For Our Girls From Soccer! These Boys Had No Idea What Happened When The Girls Schooled Them In Soccer! Ingram However Was Taking It Easy In The Sand! Our Fab Five Hitting The Waves! And Yes, Ingram Kept Up With Them The Whole Time!! Or Anything, But Amye And Len Were In Charge Of Dinner That Night! That Is How We Make Our Presence Know On Vacation! For An Hour Look At The Firetruck And All Their Equipment! Ingram Learning The Art Of Massive Sand Pyramids From Our Beach Buddies From Lake Charles, Louisiana! Playing It Safe By Heading Out To Dinner At Tacky Jacks! Ingram And Brett Having A Sleepover In A Not-So-Stinky-From The Smoke Bedroom! Soccer Balls, And Daddy Made The Best Obstacle Course Ever On The Beach! The Courageous Crew! Daddy Set It All Up For Us And We Had A Ton Of Fun! Madison, Lindsey, And Carley Parasailed And We Rode The Banana Boat With The Boys! 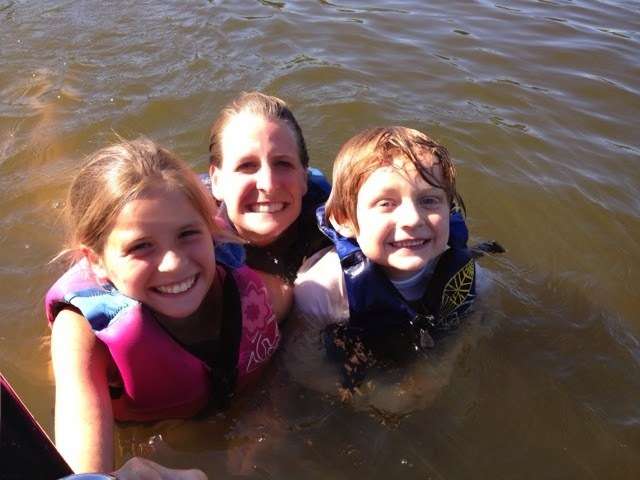 These Three LOVED Flying High Above The Water And Were Flipping And Floundering The Whole Time! I'm Pretty Sure From This Picture Right Off The Boat That They Had A Blast Parasailing!! Ingram Had The Smart Idea With His Goggles! 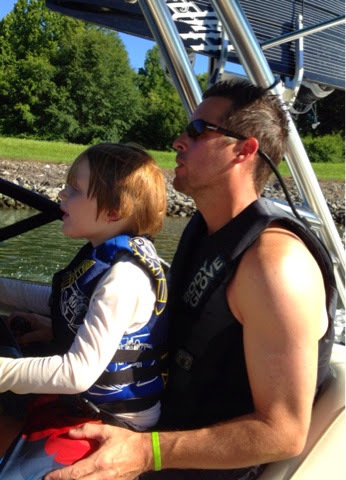 And We Thought Daddy Drove The Boat Fast When The Girls Were Tubing; This Guy Made Daddy Look Like An Angel At The Steering Wheel! Yep, We Did This Too! It Seems Like A Necessity When We're Finally All In One Place! I Think The Wind Was Blowing The Hardest This Afternoon, But We Made The Best Of It! What Better Way To Celebrate 48 Years Of Marriage This Week Than With The Kids! Picture Can Be Hard Enough With These Two, But The Wind Just Made It Way More Fun! ...But There's Always A Competition Even In The Middle Of Taking Big Family Pictures! Ingram And Brett With All Their College Girls After Dancing For Them For About Half An Hour! We Will Have To Remind Them Of This Night When They're Older! Two Little Dudes Taking Over The Dance Floor And Getting The Party Started! Foam Party For The Kids At The Hangout! those and it looks like it's supposed to be pulled!" All Tuckered Out After A Super Long Fun Night At The Hangout. I Mean, He Did Have A Foam Party With Tons Of Kids, A Dance Party With Tons Of College Girls, And Another Fire Department Incident! These BRAVE Souls Waiting In Line For The Sky Coaster! And This Little Dude (And About 10 Other People) Went Nuts Squirting Me In The Bumper Boats! We Seriously Were Soaked From Head To Toe With Obviously No Waterproof Mascara In Sight!! "Are You Sure About This?" As Madison And Lindsey Are Getting Hooked In!! Madison Is Smiling Already But I Don't Think Lindsey Is Smiling Just Yet! Carley And Brett Going Up For Their Turn! Little Man Driving His Very Own Race Car...Daddy's Lucky Number 2! "But Daddy, I NEED Dollars To Get A Snow Cone. It's Hot Out Here!" From Day One To Day Seven, We Knew Exactly Where To Find These To Characters! The Kids Spotted One Of Out Major Donors...Sewell Cars...And Had Us Take Their Picture. 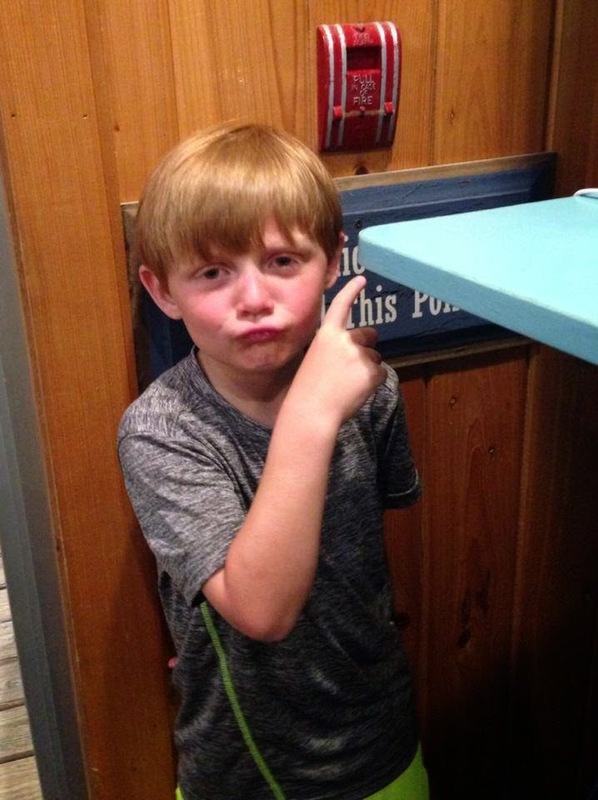 Poor Thing, I Think Peanut's Sunburn/Exhaustion Kicked In At Dinner! 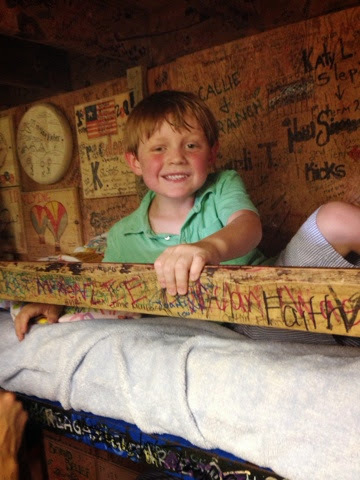 Once we were back in town, we had two more big events happen...Craig turned 40 and Ingram lost his first tooth! Unfortunately, I gave myself the "worst wife" award because I didn't have any special plans to celebrate Craig's big day and then wrapped him our new curtains (that came in that day also) for his present. Lucky for me, he still loves me anyway! While we were at the dentist for Madison and Lindsey, Ingram decided it was time for his "wiggle" to come out and so he really started working on it. 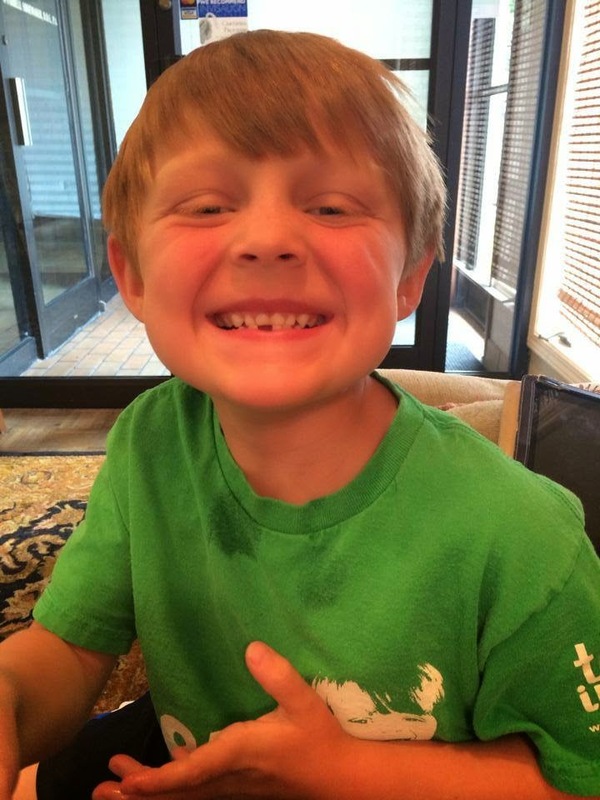 Our dentist gave him a little of the numbing gel to rub on it and the next thing we knew, it didn't hurt when Ingram was flinging it back and forth. He was sooooo excited when it came out and was showing everyone at the dentist office and telling everyone the rest of the day everywhere we went! Happy 40th To The Hottest Husband And The Best Daddy Ever! At Least The Sign Counted For Something, Right??? Success!! Making History At Dr. Floriani's Office! Jackpot!!! This Is How The Tooth Fairy Rolls In The Dismuke House With The First Tooth! As fun as July was for our family, it really made me think of our friends who can't celebrate with all the kids in their families. 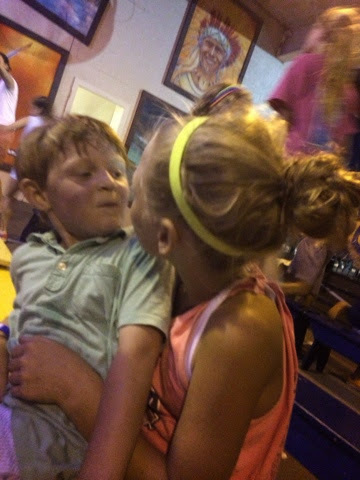 We're also approaching the beginning of a new era with Ingram starting Kindergarten in August and some of our dearest St. Jude families were supposed to be getting ready for school this year too with their sweet kids and they can't. As you look at your families and at other families and see how perfect everything is, please remember those families that don't look the same anymore because a family member is missing. Please continue to pray for everyone affected by Cancer, whether it's a child or an adult, because it's a hard journey for everyone.